A hot and muggy Saturday afternoon brought out about 25 MINIs (and Minis) for some socializing and good food. Lots of newer and potential members were there, and we got to see a few people who haven’t been to an event in quite some time. We had club members arrive from as far north as Milwaukee area, East from Indiana, and Northwest from Huntley. 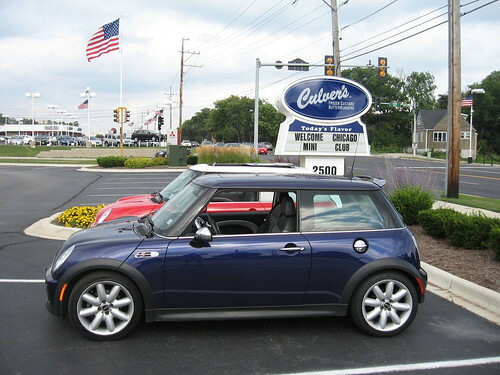 Rob from the Culvers in Downers Grove rolled out the red carpet for us by providing free custard treats, toys for the kids, and a big Welcome sign out front. Big thanks to newer member Kate for getting things rolling, and to Culvers of Downers Grove for all the hospitality!! Summer time is the perfect time to head out to Culvers!! We are having a casual hang out at the Culvers in Downers Grove on Saturday August 8th. This is a great chance to hang out, show off your car and enjoy some butterburgers and/or custard. Please add a comment below so we know you are attending. I’m going also, probably with the family. A northsiders drive sounds great, come on Mini people, let’s do it. Okay, okay! Twist my arm and count me in! I’m a Northsider and proud of it. I’ll join a ride downer to DG. I’m a Northsider and proud of it. I’ll join a ride downer to DG. Guess I better start figuring a fun way to get there. How about starting at the metered parking lot in Lincoln Square? It’s right at Leland and Lincoln Avenue, should have plenty of spaces for what I expect will only be 6 to 12 cars, and as long as we are there we won’t need to feed the meters. It’s a heavy foot traffic location, so would be lots of Mini Oglers. ugh conflict with another event! i love culvers! Same as Cathy. Ugh! I’ll be at Minis in the Mountains… Have fun!!! Well the car is back and like new again. I will try to make this one hope to see you there!!! darn… just realized I won’t be around for this one. Have fun everyone!! I will e-mail and let the NWI MINIacs club members know about this event. So far Cliffy and I will be coming for sure. I’ll let you know if any others will be joining us. I was thinking of doing This Route to head down to Culvers and avoid expressways. I have not pre-drivin this so I am not sure if it is good, but I am up for an adventure!! Paul and Kim from Huntley will attend, first time for us with this club, see you there. I would love to attend my first get together since joining the club. What time? Glad you will be able to make it, starts at about 5pm, but feel free to drop by anytime!! I am thinking about coming. I’ll be there but might be a bit late. I’ve got finals today. I’ll meet you guys there! Huge thanks to everyone who was there today. I had a great time hanging out with everybody and visiting!! Too bad I could not make it as I was at MITM. It would be great to have those types of gatherings more often… how about finding some curvy roads… I just can’t get out of my head driving up and down the mountains in Colorado… I did not even know my MINI can drive like that!